Down syndrome is a genetic condition that influences development throughout life. It is one of the most common causes of intellectual disability. 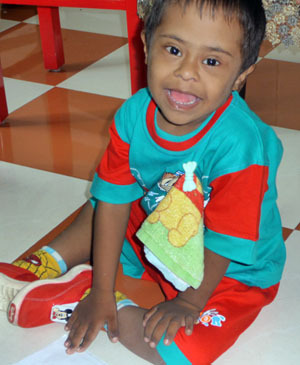 Improved medical care is helping many more people with Down syndrome to live longer and healthier lives. Improved teaching techniques and therapies are also helping many children with Down syndrome to achieve more. With more young people with Down syndrome living today than ever before, it has never been more important that we do everything possible to help them lead more independent and fulfilling lives. Down syndrome is a common human condition, resulting from an additional copy of the whole or part of chromosome 21, usually in every cell. This genetic difference is present from conception, affecting people with Down syndrome during prenatal development, infancy, childhood and throughout their adult lives. Older mothers have a higher chance of having a baby with Down syndrome than younger mothers, though children are born with Down syndrome to parents of all ages, and all social, racial and economic backgrounds. Most of the needs of people with Down syndrome are the same as for everyone else. There are, however, some additional, identifiable needs. Down syndrome is associated with increased risks of some health problems, including heart defects, hearing loss, weakened immune systems, poor eyesight and a heightened risk of early-onset dementia. Many of these problems are treatable given knowledgeable and well-resourced medical care. People with Down syndrome also experience learning difficulties that lead to delays in most areas of development. However, not all areas of development are affected equally - there are particular patterns of learning difficulties associated with Down syndrome. These patterns can inform different ways of teaching and supporting the learning of people with Down syndrome that are more successful. Down syndrome is one of the most common causes of mild to moderate learning difficulties, affecting between 1 in 1,500 and 1 in 400 babies born in different countries, depending on mothers' ages, and prenatal screening policies. In the UK in recent years, approximately 1 in every 920 babies born has Down syndrome (745 babies in England and Wales and around 840 babies throughout the UK each year). In the USA, approximately 1 in 830 babies are born with Down syndrome (4,700 annually). Across Europe, around 9,000 babies are born with the condition annually. Worldwide, we estimate that 220,000 babies are born every year with Down syndrome. In the UK, the birth rate has risen in recent years: in the five years to 2009, the birth rate was 9% higher and 22% more babies were born than in the previous 5 years. In the US, between 1979 and 2003, live birth prevalence increased by 31%, from 9.0 to 11.8 per 10,000 live births. People with Down syndrome are also living longer. Improved medical care in developed countries is now helping people with Down syndrome to live beyond 60 years - up from only 30 years in the 1970s. It has been estimated that there were 83,400 children and adolescents living in the USA in 2002. In the UK today, we estimate there to be 12,800 young people with Down syndrome under the age of 18 years. Worldwide, we estimate there to be approximately 1.6 million children with Down syndrome. With more young people with Down syndrome living today than ever before, it has never been more important that we do everything possible to help them lead more independent and fulfilling lives.